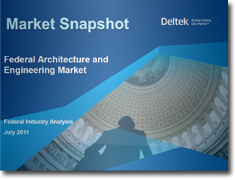 Deltek predicts U.S. Federal Government spending on AEC services will reach $9.5 billion by 2016. This market snapshot shows where, helping you to craft an efficient and effective capture process for AEC contracts ideal for your firm. Fill out the form below to download the report.